MVD Entertainment and DeInstitutionalized LLC recently sent us information for the upcoming DVD release of "A House Is Not a Home". The film stars Bill Cobbs (Night at the Museum), Richard Grieco (It's Always Sunny in Philadelphia, 21 Jump Street), Eddie Steeples (My Name Is Earl, Raising Hope) and Aurora Perrineau (Jem and the Holograms, Equals). "A House Is Not A Home" hits retail on September 27th. 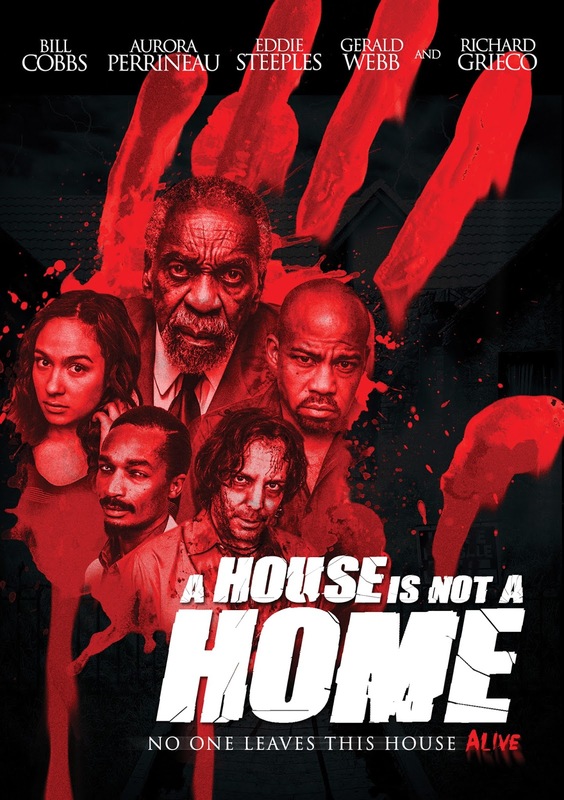 Following a limited theatrical run, MVD Entertainment Group will release A House Is Not A Home, a DeInstitutionalized LLC production, on DVD and digital platforms on September 27th. The film stars Bill Cobbs (Night at the Museum), Richard Grieco (It's Always Sunny in Philadelphia, 21 Jump Street), Eddie Steeples (My Name Is Earl, Raising Hope), Aurora Perrineau (Jem and the Holograms, Equals), Diahnna Nicole Baxter (Scandal), Gerald Webb (Criminal Minds: Beyond Borders, Sniper: Special Ops), Melvin Gregg (3.7 million Vine followers) and is directed by Christopher Douglas-Olen Ray (Mercenaries). The diversely cast horror film premiered at the Burbank International Film Festival to rave reviews taking top honors as the Best Horror Feature. In the film, Ben and Linda Williams move the family into a dream home in a last ditch effort to save their troubled marriage. Despite their good intentions, they cannot shake the feeling that they are being watched by something. Their unimaginable fears are realized when things inside the house take a supernatural and sinister turn. Ben and his family flee for their lives, but it is too late. The house isn't finished with them, trapping the family in its labyrinth. The Williams must come together as never before to fight for their family, their lives and to escape. Gerald Webb, DeInstitutionalized Managing Partner, says: "Rarely are diverse films, that fall outside of a very narrowly defined Hollywood mold, green lit by tradition studios and distributors. We created A House Is Not A Home as a direct challenge to those industry stereotypes to fill the void lacking diverse horror and thriller feature films. We are very pleased that MVD's progressive team has the foresight and commitment to diversity to join us in releasing this groundbreaking film. With the industry currently grappling with diversity issues, A House Is Not A Home's release is a needed win for diversity and fans of horror and thriller films everywhere." Eric D. Wilkinson, Director of Home Video Sales and Acquisitions at MVD, says: "I'm thrilled to be working with the team at Deinstitutionalized on the release of the thriller "A House is Not a Home". MVD Entertainment has a long history of successfully supporting independent films and independent filmmakers and Christopher and Gerald have crafted a fun thriller with a diverse cast that I look forward to bringing to the marketplace across all platforms."